I have always been a Coleridge fan and while building my first all mesh jewellery set things sort of got out of hand. 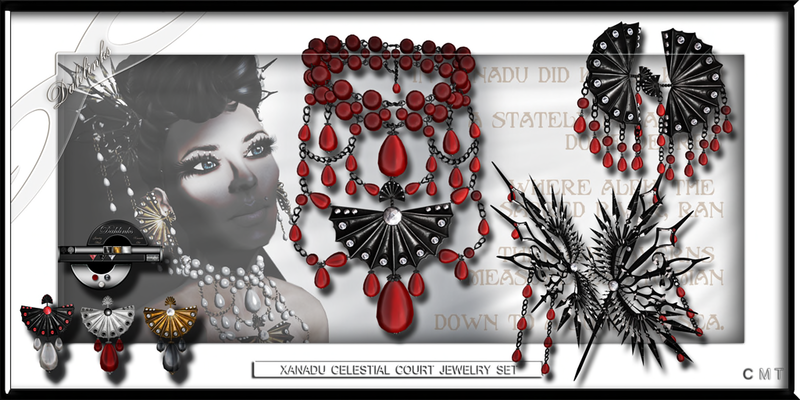 The new Xanadu set, releasing today both inworld and on marketplace, includes earrings, necklace as well as hair pins. In addition to being my first all mesh design, this is also the first Dahlinks Mesh Hud driven jewellery set. With 3 gem, 3 metal and 3 pearl options, you can choose which style best suits you and 'your demon lover'. It has been a long time since I blogged anything but new releases from Dahlinks, so when the fabulous Mimi of Mimi's Choice asked if I would like to blog the MWV 2014 Miss Indonesia gown from Pixivor Allen of ALAFOLIE I jumped at the chance. The gown was originally designed for MVW 2014's Miss Indonesia but tragically never had a chance to shine on the runway. And tragedy is the right word, this mesh based design fits beautifully and flows with your movement. The scripted hud allows you to choose from 6 different styling colour options. With a simple click you can co-ordinate the skirt, bodice fascinator and crystal accents to suit your mood. I would also like to suggest that anyone looking for a unique wedding dress should try the demo for this design. The 'white' option shimmers with the glory of the arctic lights... Or perhaps the sheen found on high quality mother of pearl.